Ontario-based Aberrant Software Inc is one of the most interesting and, well, aberrant companies out there. In a good sense too, since most of the time deviation from the normal considered to be risky. Not in this case though: ever since its creation in 2010 Aberrant Software has been using their location in the heart of one of the most developed countries around to get good at their craft. Aberrant Software Inc is a company with headquarters in Ontario, Canada and they specialize mostly in bingo, even though they are quite good at providing premium solutions for some of the best companies out there that work with Keno, match, Hi-Lo, slots, and other games. Far from being a one-trick pony, Aberrant Gaming has a few years behind the steering wheel, from 8 to 10 depending on what you count as experience, and are able to provide a decent quality of software across the board to be accepted at some of the more popular bingo sites. This company is owned privately, so little is known exactly about their practices, but we are impressed by what we see (you will have heard about Unibet, no doubt, which is one of the casinos they work with. Now, this guy may not be huge like Microgaming but even Google, Microsoft, and Microgaming started off small and specialized, right? They are also no short of ambition, it seems, but they do have something to back it up with, and in their field they are actually very good, working with some of the most successful companies out there. 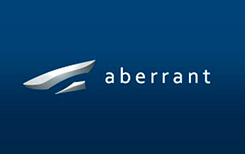 “The Aberrant Gaming Suite comprises a turn-key online solution which includes a wide variety of games such as: multi-player and single player bingo (75 ball, 80 ball, 90 ball and Variant styles) along with an assortment of soft games such as Slot Machines, Instant Keno, Video Poker, Hi-lo, Match and Scratch tickets.” The site, however, looks like a cat walked across the keyboard when WordPress was open, giving us the impression it was created entirely by accident. Still, there is truth to that old saying that good things don’t need advertising: quality speaks for itself. With partners like Utopia Bingo, Trendy Bingo, Best Bingo, and Maria bingo and with a suite of products in a few areas as well as turn-key solutions and an elegant back office we think there is way more here than is required for a successful business. We like the standards of quality, a modest interface, and a through-through website.